The E-go concept is Husqvarna’s idea of the ideal urban supermoto. 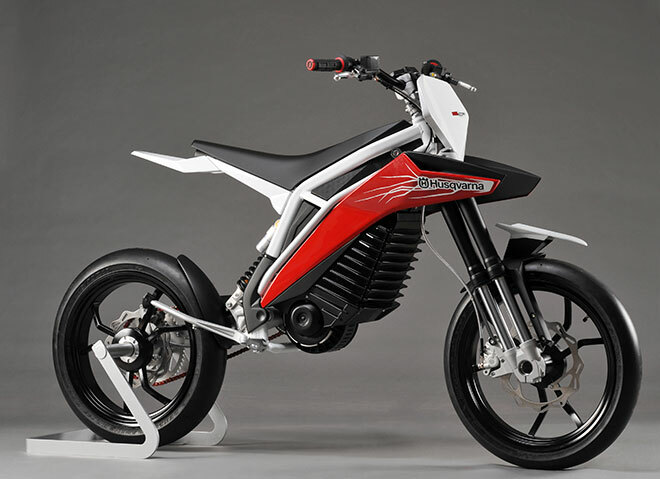 It’s got an electric drivetrain, a single-sided front end, the daintiest wheels ever fitted to something purporting to be a motorcycle and styling clearly influenced both by Husqvarna dirt bikes and the Intelligent Energy ENV e-moto. The motorcycle, unveiled this week at the Frankfurt Motor Show, sure is neat, which is why it’s a shame it’s so far from being production-ready. As far as technical details go, BMW (which owns Husqvarna), will only say the machine weighs 80 kilograms (176 pounds) all-up. That’s extraordinarily light — 4 kilos lighter than the 3/4 size Zero X electric dirt bike. The Zero achieves its trim weight using a 2 kilowatt-hour battery and components that have more in common with mountain bikes than motorcycles. The Husqvarna can’t hope to carry much more in the way of battery capacity (enough for an EPA-certified 22 miles on the Zero), given that it’s equipped with heavier running gear in the form of that two-tube, single-sided front and remote-reservoir Sachs rear shock. That single-sided front is a neat piece of concept bike showmanship. Two 35mm tubes, as opposed to one larger tube like that of the Gilera CX125, create lateral and torsional stiffness, but at the expense of added weight and complexity. Two sliders, two stanchions, two springs, two sets of valves, two sets of adjusters and two tubes full of oil: Such a setup will admirably resist flex and is very strong, but it is a lot of unsprung weight. On the plus side, wheel changes should be easy. Despite the clear ENV influence (envy? ), the styling is enormously successful at translating Husqvarna hallmarks into something bold and futuristic. Remember the Husqvarna SMQ concept? This new bike adapts its chunky white frame tubes and angular body into something much more attractive. Also noteworthy is the wing-like front mudguard borrowed from the Husqvarna Nuda 900; will this be a new family identifier? 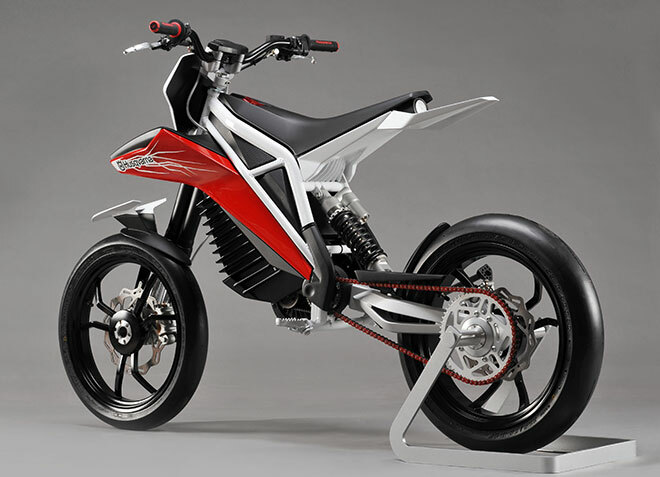 The fictional battery pack and (reportedly functional) electric motor also are neatly integrated in a way not typically seen on production electric motorcycles. At the risk of committing e-heresy, this thing sure would be sweet with Husky’s two-stroke 250 engine in it.